Looky who we are. Lucky Ducks I’ll tell you. We have the privilege of living in the United States of America. As part of that, we are afforded a number of freedoms. A big number. Complain, as you will, about this country. It is our Right to complain. We have Freedom of Speech, as appointed by our Constitution. We can also worship in any way we choose. It is called Freedom of Religion. I wish a WHOLE bunch of people would remember this one… but they only remember it when it comes to their religion. But that ball of yarn is for another time. One of our big privileges comes to us in the way of the vote. Yes. We have the Right to Vote. Well. Sort of. The right to vote of citizens of the United States remains a kind of a “guilt by association” in the scheme of American rights. It is not listed in the Bill of Rights. We just sort of “gain” this right with the other cool things spelled out in the First Amendment. In fact, voting isn’t really mentioned until the 14th Amendment… in a sideways kind of way. Of course the 15th Amendment gives black men the right to vote. And thank goodness for the 19th Amendment, which guarantees women the right to vote. The U.S. Constitution, was adopted by the Philadelphia Convention on September 17, 1787. The only men who were “created equal at that time” … … …were white guys, who owned slaves. Yeppers. They were the only chappies who could cast a ballot. You get to be a part of the Club. Not like the Mickey Mouse Club. More like finally getting to golf at Augusta. I’ve been saying all of this in a lighthearted manner, but the truth of the matter is, a lot of people have died and suffered … …… worked and sacrificed … in order for me, and you, and you, and you, to have the right to vote. The very least we can do is to thank them. And the best way to do this? 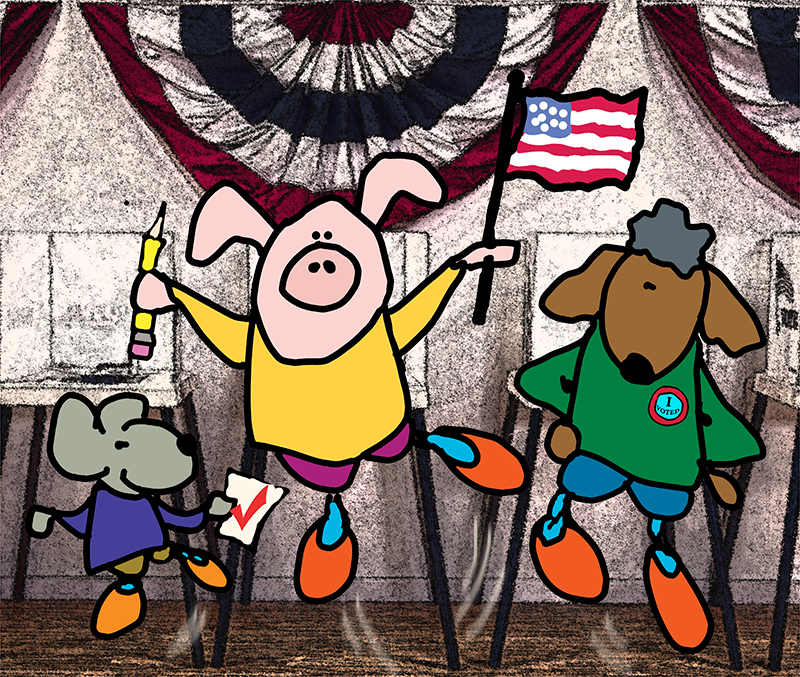 We ALWAYS need to get off our butts and vote. It is not only our right, and our privilege, but it is also our duty. Or perhaps more to the point, it is our great, great, freedom. Who are we. We are we.